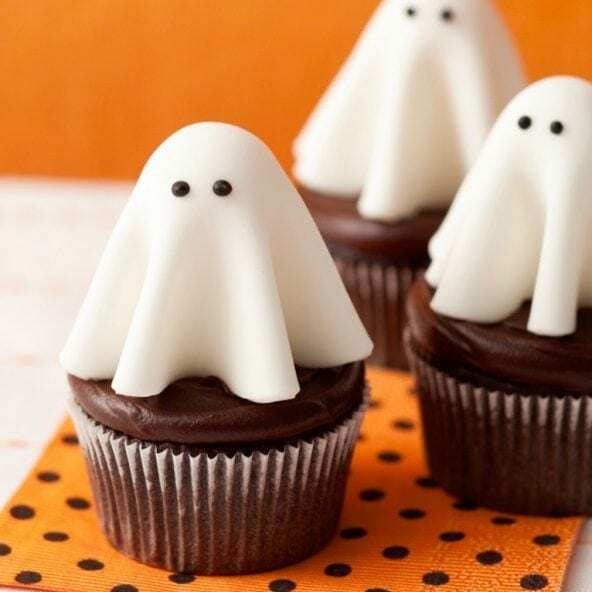 Floating ghost cupcakes will make all the ghouls come out to the Halloween party. These cute fondant treats are easy to make, even the little witches and storm troopers can help. Frost cupcakes and set aside. Lightly dust work surface with cornstarch and roll fondant a little thinner than ⅛ inch. Cut 18 1½-inch rounds and 18 4-inch rounds with cookie cutters. Knead scraps together and reroll, as necessary. Insert the stick of a lollipop into a block of Styrofoam (or half a potato or apple) to hold it steady. Place one 1½-inch fondant round over lollipop and pinch to close. Then place larger fondant round over the smaller one, pleating to make a ghost shape. Repeat for all lollipops. Place a ghost in the center of each cupcake by inserting the stick into the cake. Pipe black eyes on each. Fondant scraps can be re-rolled. Imagine the fun your little ghosts can have!